1. 1. Which are your Top 4 favorite articles? We apologize for the delay in announcing the results, but we've been so busy with getting the new site up and running that announcing the top 10 for the article contest had to wait. There were so many great articles submitted for the Winter contest in October, November, and December. A big thank you to all who submitted the articles as well as those who read, liked, and/or commented. If you are one of the first timers for submitting an article, I hope you will continue to write more articles. It is a tough job to select 10 top articles. The top 10 articles are listed in below. We are counting on our readers to help select the Top 4 Winners. Each winning author will receive $150, so please help us with your votes. Use the poll above to vote for your 4 favorite articles. You may select up to 4 articles. You must be a registered member to vote. If you are reading this as a guest and would like to vote for your top four articles, Join Today. 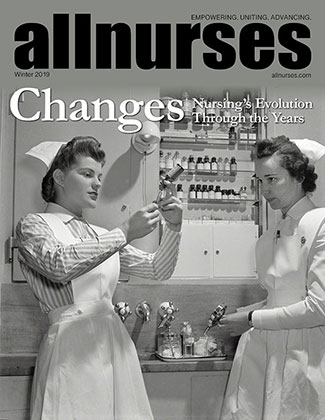 It just takes a few minutes to register and create a free account with allnurses.com. Enjoy reading and voting for your TOP 4 ARTICLES. VOTE TODAY before the poll closes! !